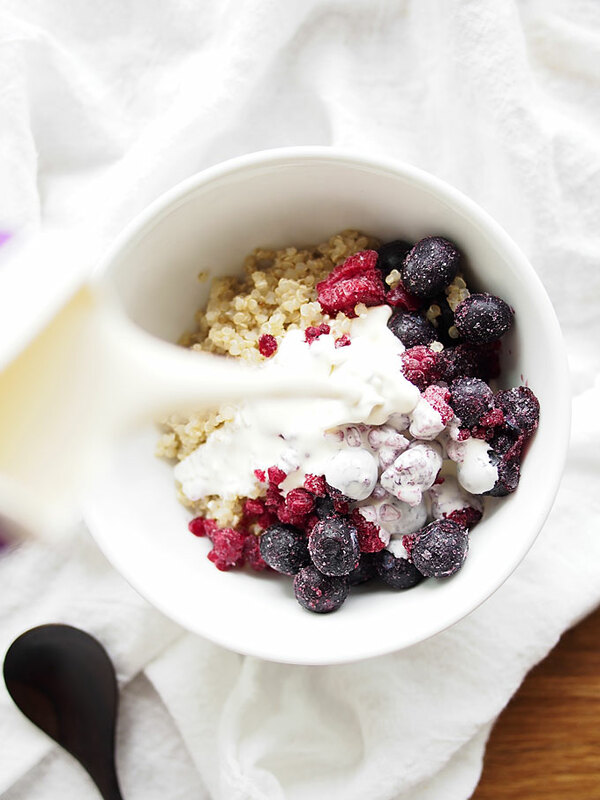 Coming atcha MONDAY with an easy-peasy, belly-loving, yum-yum breakfast goodness recipe: QUINOA! We’ll get to that. How was your weekend!? Tell me what you did! I had a pretty mellow weekend, meeting up with friends and family for various meals, checking out a super cute craft fair (where I wanted to buy ALL THE THINGS), and getting my PICTURE TAKEN BY RADIANT HUMAN. OMG! I’ve waited MONTHS for her to be in Portland so I could get my picture taken, and finally: it happened. Check it out. (Also, I got bangs. VERY undecided about them.) Yeah, it was a hippy dippy Portland experience and I LOVED IT. Also, it rained! I haven’t seen Portland rain in a LONG time, so it was actually pretty darn nice to get some cooler temperatures coming through. ONTO THE QUINOA! Since I’ve had so much quinoa on hand to make my new bff vegan veggie bowl, sometimes I find myself with TOO much quinoa (AS IF THAT IS A THING) and needing to use it up. 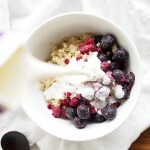 Also, just being lazy and not wanting to cook breakfast — enter the TWO MINUTE BERRY BREAKFAST QUINOA. So, SO easy. And: YUM. I have another breakfast quinoa recipe here already — it starts with uncooked quinoa, then you cook it in coconut cream and it is DE-LISH-US. 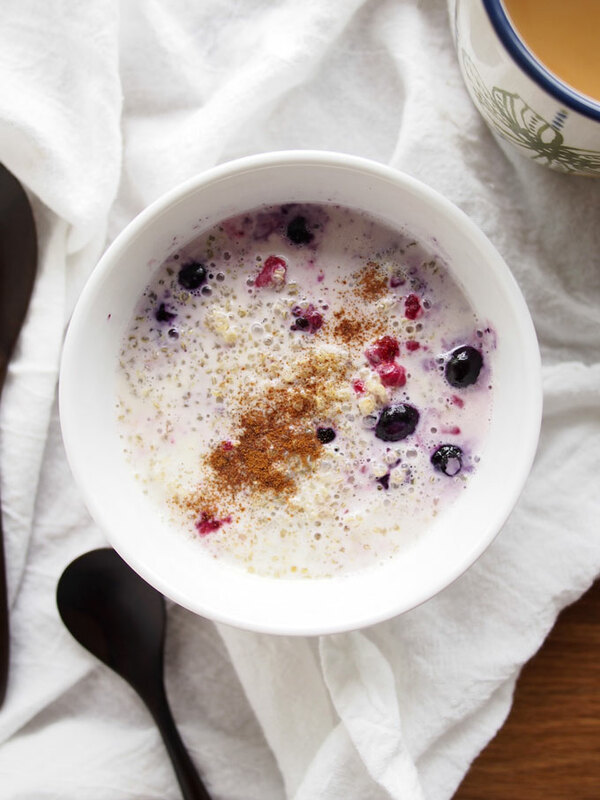 This one starts with cooked quinoa, and all you need is milk (I’ve been using coconut milk or cashew milk), berries (I’ve been using frozen), and a sprinkle of cinnamon. Pop it all in the microwave for 60-90 seconds and BOOM: tasty tasty breakfast! Not to mention healthy. And easy. And yum. I’m gonna be 100% honest with you guys: I used whipping cream to make this the other day… NOT SORRY! It was so good. And waaaay guilty! 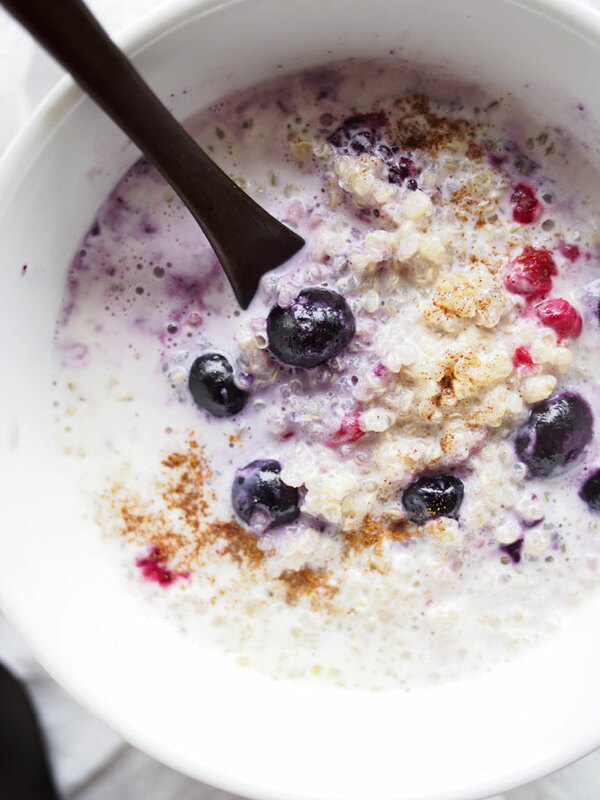 This simple breakfast quinoa uses cooked quinoa, frozen berries, nut milk, and cinnamon for a high-protein, quick breakfast. Stir and test the temperature, microwave for another 30-60 seconds if needed. I love the bangs! Does it usually rain up in Portland during the summer time? And heck YES to this easy peasy quinoa bowl! Thanks, Lisa! It does NOT rain much in Portland during the summer… the last two days are the only rain I’ve seen in MONTHS! But a very welcome change (and cooler temps are always nice!). Have a great week! WHAT GROCERY STORE THAT CARRIES THIS “QUINOA”? I see that you mentioned that you cooked the quinoa in coconut cream. I get really nervous about cooking with creams, how would you cook the quinoa in cream? Hi Leslie! I have instructions for cooking quinoa in coconut cream in this recipe — just bring it to a simmer and let it cook! Enjoy! I am pre-diabetic and am trying to count calories and carbs. 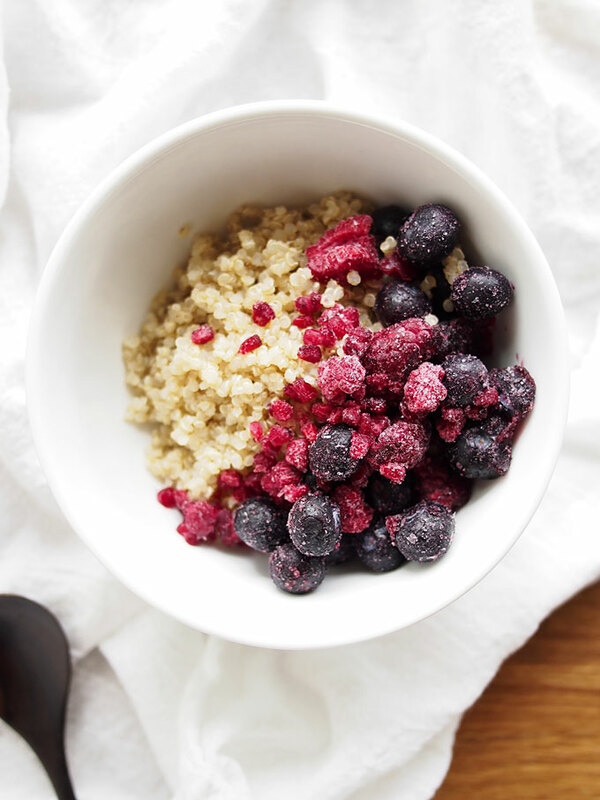 How many calories are in the quinoa/berry dish? This is a great breakfast for me. Thanks.